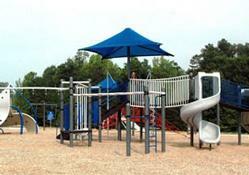 The playground is unsupervised and includes a kids lot (ages 5–12) and tot lot (ages 2–5). There are a limited number of picnic tables located around the playground area which are available on a first-come, first-served basis. 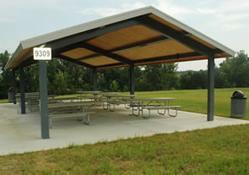 North Wake Landfill District Park has one picnic shelter with tables to accommodate larger groups (there are 7 regular tables and 2 handicapped tables). The shelter is available on a first-come, first-served basis. Capacity: 75 persons. Note: There are NO grills at in the North Wake Landfill District Park. Please do NOT bring grills to the park. No open flames or fires, no grills of any kind, no fireworks, and no smoking. 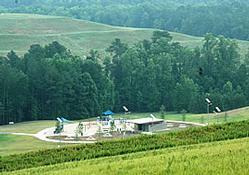 This innovative park is located adjacent to a recently closed landfill with a landfill gas (55% methane) collection system, and we must eliminate the potential for grass fires. Please read rules and regulations for additional information. Paved walking trails take you across Nance Spring Branch creek, around Nance Spring Loop and connect all of the park facilities. 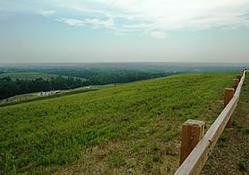 Multi-use Trail "Top of the Hill Trail"
Hike or bike to the top and enjoy spectacular views! On a clear day, you can see the Raleigh downtown skyline. You may access the top of the landfill from the "Top of the Hill Trail" gravel trail located near the park entrance sign (you can park in gravel parking lot right there and follow signs to trail access). *Remain on the designated trails around and on the landfill at all times, and to prevent injury do not walk or ride bikes on the slopes of the landfill. North Wake contains 2 miles of mountain bike trails built through a grant from North Carolina State Parks. The trails are designated for beginner and intermediate skill levels. A skills area is also provided for those wishing to build their mountain biking skills and comfort level. The mountain bike trails are subject to closure during inclement weather, special events and natural recovery. The open play area is open to all and is available on a first-come, first-served basis.